A little magic went a long way after Matt Harvey put the Mets in a 6-0 hole early, but the bats came alive and the team stormed back to win 8-6 on their biggest comeback of the season. After a rain-shortened start last time out in which he lasted just 3.2 innings while giving up three walks and four hits, Harvey somehow was even worse last night: 3.2 innings, 11 hits, six runs (five earned) and just four strikeouts. It’s tough to know what to say about Harvey — his command is close and his velocity is back, but he’s just not right. The Mets have chosen to continue running him out there, hoping he’ll eventually figure it out, but that’s a risky game with the team in the thick of a pennant race. A week ago, a 6-0 deficit would have seen me turning off the TV, finishing up some errands or catching up on reading. Instead, coming off a four-game sweep of the Cubs, six runs down was nothing. Travis d’Arnaud started the comeback with a solo home run in the fourth inning and Curtis Granderson followed with one of his own in the fifth inning. The Mets pulled within two in the sixth against Kyle Barraclough, who allowed back-to-back singles by Asdrubal Cabrera and Wilmer Flores to start the inning, followed by a walk to Brandon Nimmo. d’Arnaud came through again with an infield single to score one and Kelly Johnson’s bases-loaded double play brought the score to 6-4 Marlins. James Loney drove in the fifth run of the game with a ground out to score Neil Walker and Flores’ sacrifice fly tied the game at six as Yoenis Cespedes sauntered home. New Marlins set-up man Fernando Rodney didn’t do much to endear himself to his new fan base in the bottom of the eighth as the Mets came roaring back. d’Arnaud led off the inning with a single, then moved to second on a Juan Lagares sacrifice bunt — Lagares was originally called safe but the play was overturned on umpire review. Granderson flew out and Walker trotted to first on his third free pass of the game. 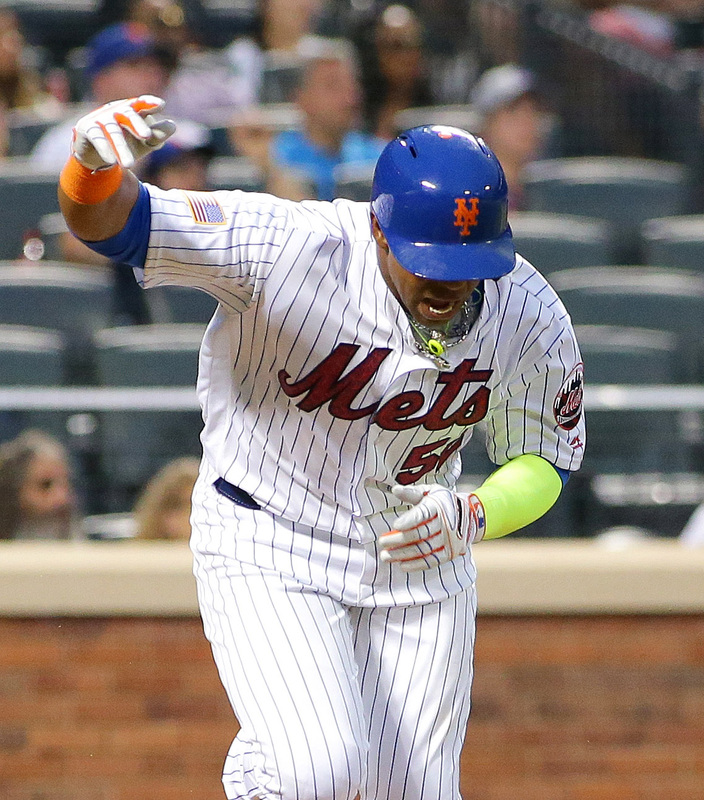 Then, with Citi Field shaking and fireworks exploding around New York, Cespedes came through, lacing a double into center field as d’Arnaud and Walker raced home to put the Mets up 8-6, a score that would hold for the team’s fifth straight win. After Harvey left the game in the fourth to a chorus of boos, Erik Goeddel, Logan Verrett, Hansel Robles, Jerry Blevins and Jeurys Familia combined for 5.1 scoreless innings as the offense staged their comeback — and let the Dark Knight off the hook again. Familia also picked up his 29th consecutive save to start the season, a perfect record in 2016. The Mets announced that Jose Reyes will be activated for today’s game. Terry Collins had previously stated that he intends to bat Reyes leadoff, which will see Granderson drop in the lineup. With the Marlins throwing two lefties — Wei-Yin Chen and Justin Nicolino — over the next two games, expect Reyes to play third base with Flores spelling Loney and Walker on the right side of the infield.